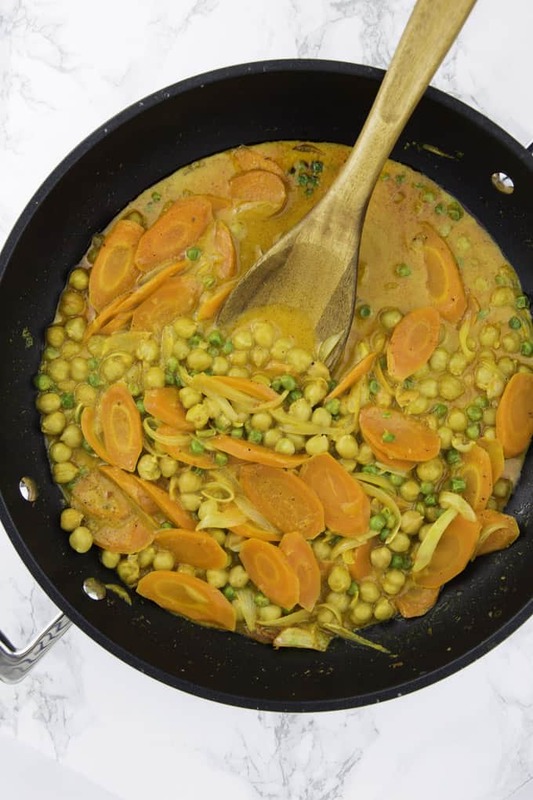 This easy vegan chickpea curry with potatoes, peas, and carrots is perfect for quick weeknight dinners! It’s delicious, comforting, and packed with protein and nutrients. And it’s ready in only 30 minutes! 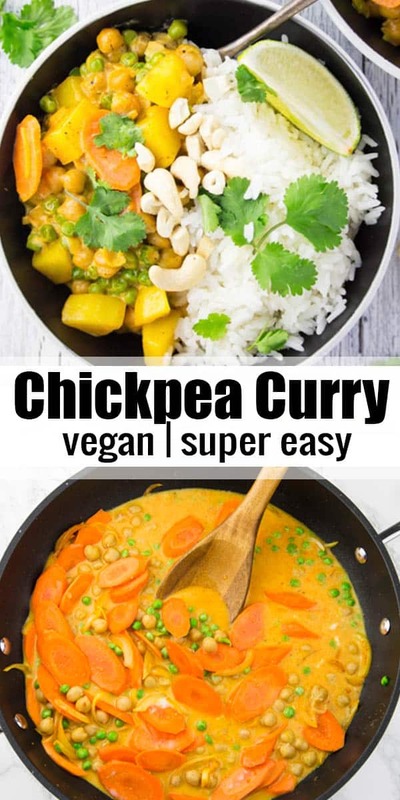 This vegan curry is one of my all-time favorites! I’ve made it so many times and it’s always a winner! We make it almost every week and it’s perfect to use up leftover vegetables. It’s sooo good and the ultimate comfort food for me! 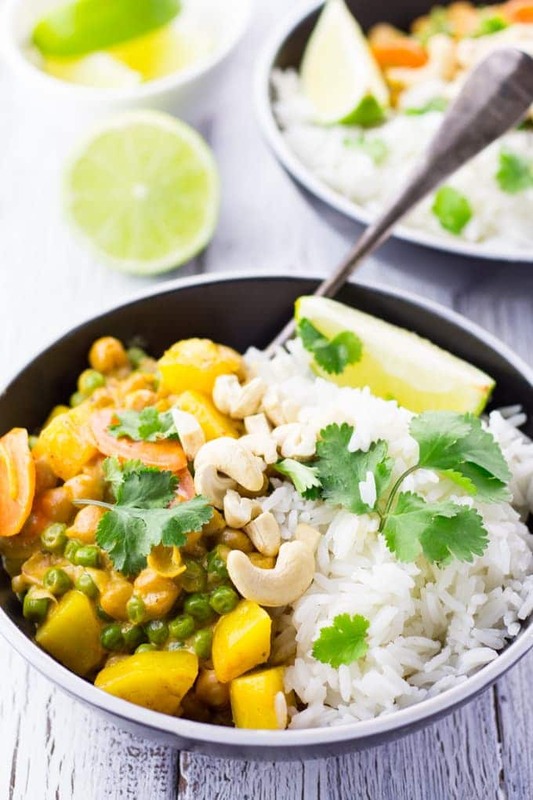 Top it off with some cashews and cilantro and you’re good to go! 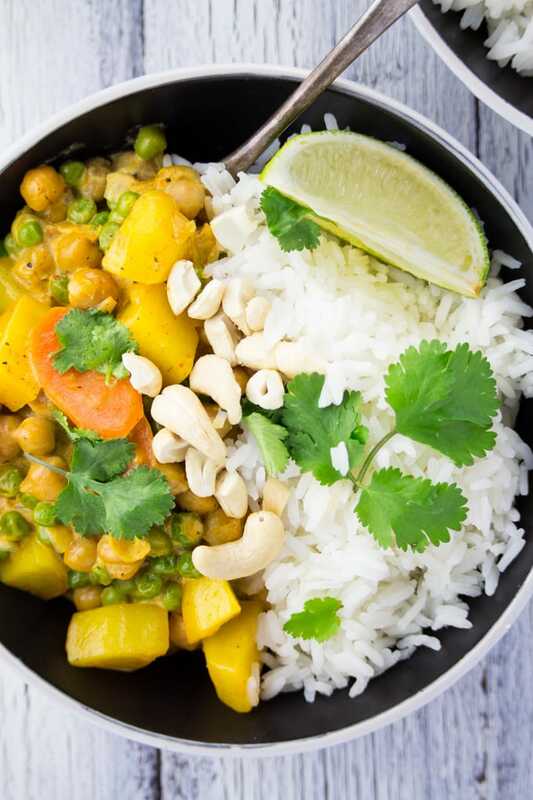 You can find all of the ingredients for this vegan chickpea curry in any regular grocery store. 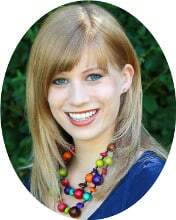 As always, you can find the full ingredient list and detailed recipe instructions in a separate recipe box at the end of this post. STEP 1: Cook the rice according to the instructions on the package. I like to use Jasmine or brown rice. STEP 2: In a large pan, heat some oil and sauté the onion for 2-3 minutes. Then add the potatoes and cook for another 3 minutes. Stir in the red curry paste and the curry powder and cook for another minute. STEP 3: Add the coconut milk, vegetable broth, carrot, chickpeas, and peas and cook for about 20 minutes. STEP 4: Season with salt and pepper and serve with cashews and cilantro. Adjust the curry paste to your personal liking. The curry paste I used was rather mild. Sometimes I even use two teaspoons. But make sure to check yours before adding too much, so your curry doesn’t get too spicy. I included potatoes in the original recipe. However, if you want the vegan curry to be quicker, you can just leave them out. I make this vegan chickpea curry all the time and I think about half the time I’m not using potatoes. Cook the curry for about 15 minutes if you’re not using potatoes. Make sure to use canned full fat coconut milk for this recipe. I had some people making it with boxed coconut milk (like almond milk), which didn’t work out. You need the canned full fat coconut milk for a creamy curry. Serve the curry with brown rice for a healthier version. If you’re using potatoes for this vegan curry, make sure to cut them into small cubes. Otherwise the recipe will take longer. I used frozen peas for my vegan curry, but of course you can also use fresh green peas. Yes, curry is a very vegan-friendly dish. It mainly consists of fresh vegetables, coconut milk, and curry paste. You can also use legumes like chickpeas. However, many store-bought curry pastes contain shrimp, so make sure to check the labels or ask the waiter when you are eating out. What veggies are good in curry? I used carrots, potatoes, peas, and chickpeas for my vegan curry. However, there are also many other vegetables that are great in curry. Yes, in general curries freeze rather well. However, the coconut milk might look a bit grainy after defrosting. If you have any leftovers, you can freeze them in an airtight container for up to three months. I always like to add a label on top, so I know when I cooked the meal. How long will curry last in the fridge? Curry will last about 4-5 days in the fridge in an airtight container. It might even be good for up to 7 days. But always make sure to check the food for any weird smells. Besides, don’t leave it on the counter for more than 2 hours after cooking. 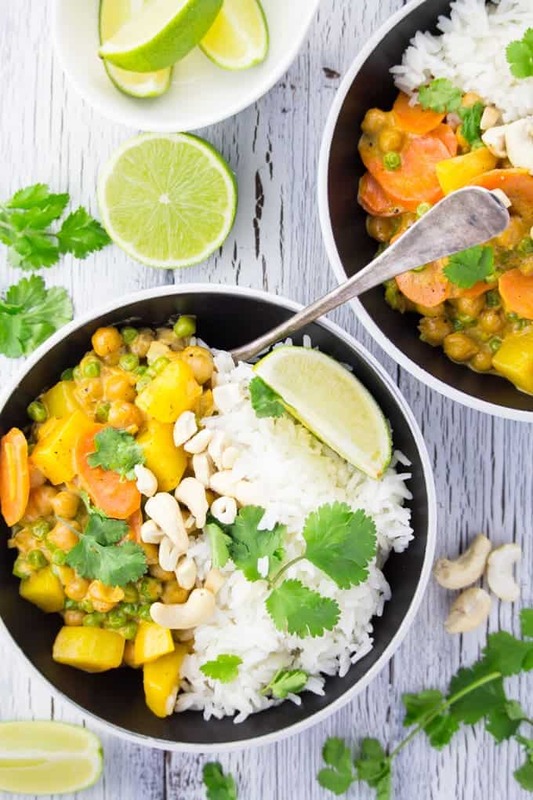 This vegan chickpea curry is not only super delicious but also pretty healthy. It’s packed with nutrients and protein! Chickpeas are sometimes also called garbanzo beans. They are very high in fiber and protein. One cup of chickpeas contains 15 g of protein and 13 g of fiber. They also contain zinc, selenium, magnesium, and vitamin B-6. Besides, they’re also a great source of iron for vegans and vegetarians. Chickpeas are very inexpensive and are a great addition to vegan meals. They’ve got a lot more health benefits, such as helping to keep your appetite under control and managing your weight. Green peas are fairly low in calories and contain a variety of important vitamins and minerals. Like chickpeas, they are also high in fiber and protein. Besides, they contain antioxidants. 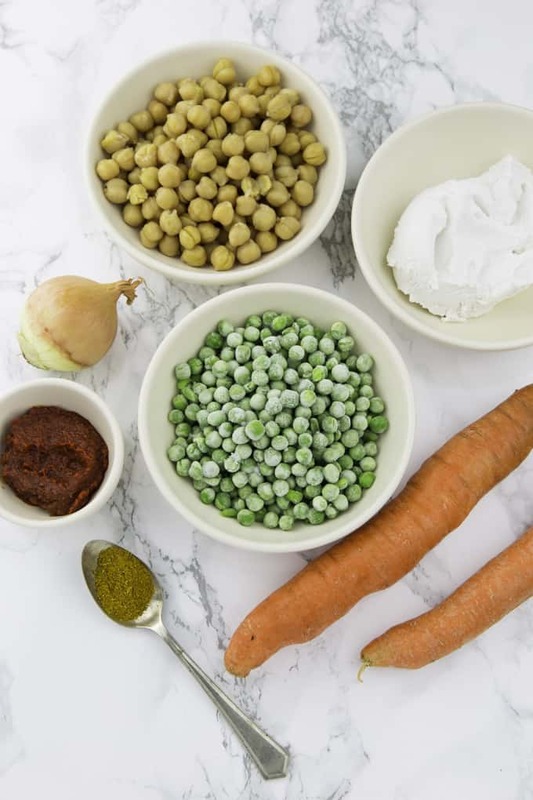 So the combination of peas and chickpeas is super good for you! Orange carrots get their bright orange color from beta-carotene, which is an antioxidant. In the human body, it is converted to vitamin A. Several studies propose that carrots can help to lower cholesterol levels and improve eye health. I hope you like this vegan curry recipe as much as we do around here. 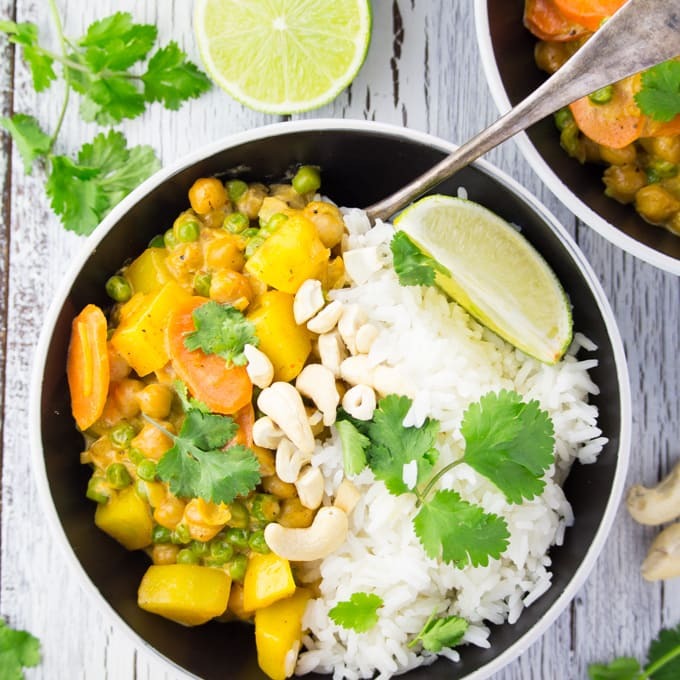 This easy vegan chickpea curry with potatoes, peas, and carrots is perfect for quick weeknight dinners! It's one of my all-time favorites! So yummy! Cook the Jasmine rice according to the instructions on the package. 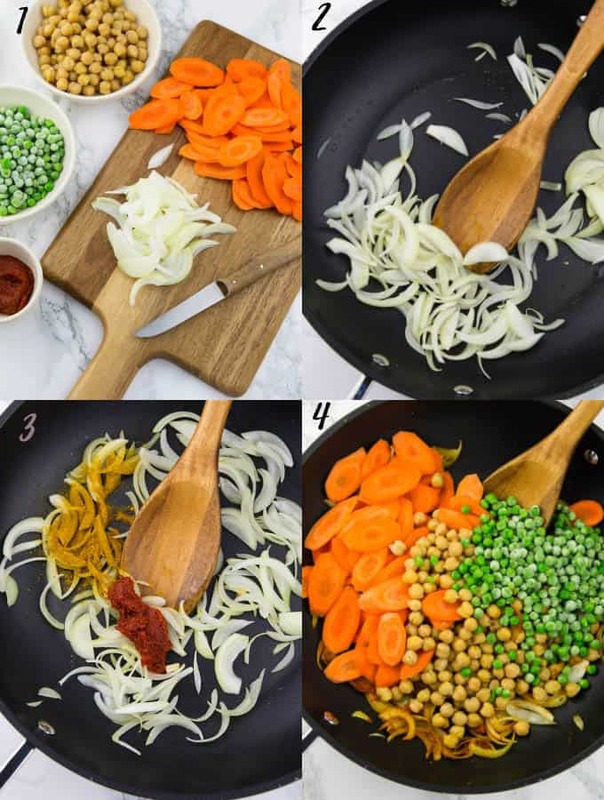 In a large pan, heat some oil and sauté the onion for 2-3 minutes. Then add the potatoes and cook for another 3 minutes. Stir in the red curry paste and the curry and cook for another minute. Add the coconut milk, vegetable broth, carrot, chickpeas, and peas and cook for about 20 minutes. Season with salt and pepper and serve with cashews and cilantro. Filed Under: All Recipes, Beans/Legumes, Entrées, Recipe, Rice and Quinoa Tagged With: can you freeze curry?, how long does curry last in the fridge?, how to make vegan curry, vegan chickpea curry, vegan curry, vegan curry with coconut milk, vegan pea curry, vegan potato curry, vegetarian chickpea curry, vegetarian curry with potatoes and chickpea, what vegetables are good for curry? « Vegan Appetizers – 25 Delicious Recipes! Rice and potatoes…yes!! And in a delicious coconutty curry? Double yes!! Carb me up! this is the kind of meal i like to make and eat throughout the week..love cashews here. Beautiful photos, Sina! I love curry and this one sounds delicious! So simple, yet so flavorful! Thanks, Jenn! Totally agree with you, that’s the best thing about curries! A fab looking curry! Your photos are beautiful and i love all those healthy ingredients. I adore potatoes in curry. There is something about the floury texture and the sweetness that I love. Love the colors and flavors in this dish. I could go for a big bowl right now. At least all the carbs are countered with vegan protein! The recipe looks yummy and since I’m a fan of curry, it’ll be on my list to try. So glad you like it, Uma! I love curries. And this exactly the kind I like. Got to love that potato and chickpea combination. I can’t wait to make this! So curry is not my favorite flavor, but I know so many people that love it and this dish just looks so gorgeous! And I love love chickpeas and potatoes so I would totally eat this, just without the curry sauce. Is that allowed?! LOL Is this the same curry dish you posted on our sharing thread? If so, then it’s the one that was a huge hit with my readers! This chick pea curry looks delicious, I make curry at home everyday. I made this last night and it turned out good!! Next time, I’ll add Srircha when it’s cooking and more red curry paste. Thanks for sharing! Made it twice this week! I used sweet potatoes & added black beans this time. I was not able to find red curry paste without lemon grass so I used Yeoman’s curry sauce from a can and it came out beautiful! This worked well in my slow cooker. Thanks. This was very very good and easy to make. Even my young daughter who is a little picky liked it. Not too spicy at all!!! I bet this tastes great, but the coconut milk alone has 50g of saturated fat, 25g per serving. What is the nutritional break down for the whole dish? This dish was everything it was advertised to be! My whole family enjoyed it including my pescatarian husband, my picky 9 year old and my vegan 2 year old. This will definitely be a weekly staple! I followed the recipe except I used the whole bag of peas since the bag of organic frozen peas is relatively small. I used about 6 red potatoes since that’s what I had on hand. And I added a bit of Jamaican jerk seasoning. I loved the simplicity of ingredients and that the prep time was truly not extensive. Thank you so much for sharing!!!! Hi, this looks great. I’m an experienced curry maker and I’m looking forward to making this. I’ll be making it in a trailer tent awning at a festival, for 6 people, including 2 veggies and 1 vegan. My question is, do you think it will freeze? Ideally, I like to make a few dishes ahead of time, then let then defrost in the coolbox over a few days. It helps keep everything cool and makes cooking in the tent awning much easier. If you buy them in a bag they are not cooked, so you would need to pre-cook them by following the instructions on the bag and then add it to the recipe. The chickpeas in the can are precooked and you simply have to rinse them. thanks for asking this question. i’ve never cooked with chippers and didn’t know which ones to buy. can’t wait to surprise my wife with this one. I tried it last night! So easy and so good! I put more curry since I like spicy stuff and we added sambal oelek! My boyfriend is not a big fan of coconut milk, but he enjoyed the meal :) We’ll definitely cook it again! My family loved this recipe! It’s super yummy and so easy to make, perfect week night dinner! I used sweet potato instead, but it turned out great! Will definitely make this again. Much better than the last curry I tried. I used one large baking potato. One can of chickpeas was slightly more than 1.5 cups, so I just threw in the whole can. Even with the curry powder and paste, it still came out bland, so I plan on adding some cayenne pepper to zing it up. Super delicious and REALLY filling! I also found it a little bland but adding extra curry powder, salt, and pepper solved the problem. The ingredients are easy to find and it wasn’t super hard to make! Thanks for the recipe!